The 2016 Election isn’t the first time votes in the Electoral College determined the winner despite the popular vote going to the other candidate. Last week we looked at what the Electoral College is. You can access the discussion and a look at early electoral controversies here. Each state’s Electoral Votes is the tally of its Congressional Delegation. The image on the left is a 2016 map showing the number of Electoral Votes each state cast. In 1860 four political parties advanced candidates for the presidency at a time when the nation was breaking apart over the issues of Slavery and State’s Rights. The Democratic Party split. The Southern Democratic Party (Green) and Constitutional Union Party (Orange) were the only parties on the ballot in the southern states. The northern states split between the Republican Party (Red) and the Northern Democratic Party (Teal). It’s as if each section had a separate election. However, the bulk of the popular and electoral votes were in the northern section. The northern states had 192 Electoral Votes, and a popular vote of 3,146,110. The southern states had 111 Electoral Votes and a popular vote of 1,438,920. The southern states didn’t accept the results, and the nation embarked on four years of civil war. The victorious United States abolished slavery, and established the principle that states may not secede from the nation. The 1932 Election wasn’t controversial, but the years of Franklin D. Roosevelt’s presidency changed the nation. Americans elected FDR to an unprecedented four terms. In fact, Roosevelt was the first president to run for a third and then a fourth term. 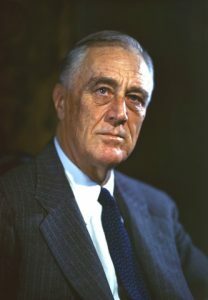 FDR instituted an unprecedented number of social and economic programs in his efforts to lead Americans out of the Great Depression. Frances Perkins, the first female Cabinet member, encouraged Roosevelt’s support for Social Security which became law in 1935. The Roosevelt presidency extended into World War II. Americans elected their commander-in-chief to a fourth term of office in 1944. The president died in 1945, and Vice President Harry S. Truman took office. As the 1948 Election approached many Americans wanted change. In 1946 Americans elected a Republican Congress. Truman’s approval rating was low at 35 percent. At the Democratic Convention, Truman supported a Civil Rights plank in the party platform. The entire Mississippi Delegation and part of the Alabama Delegation walked out of the convention. Two weeks later, Truman issued Executive Order 9981 to racially integrate the Armed Services and Executive Order 9980 to integrate all federal agencies. The Republicans ran Thomas E. Dewey, governor of New York, who lost to FDR in the 1944 Election. Despite his strong credentials, Dewey was unexciting. Alice Roosevelt Longworth (Teddy Roosevelt’s daughter) famously described Dewey as the Little Man on the Wedding Cake. Dissenting Democrats formed the States’ Rights Party and nominated Strom Thurmond for the presidency. It was a hard fought election campaign. 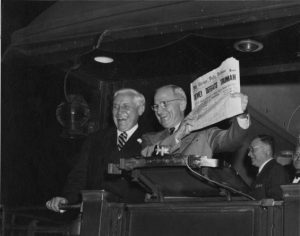 Truman embarked on a “whistle stop” tour, shook hands with voters and reminded them the Democrats saved Americans from the Depression. Dewey spoke to larger crowds. Polls indicated he had a comfortable lead. 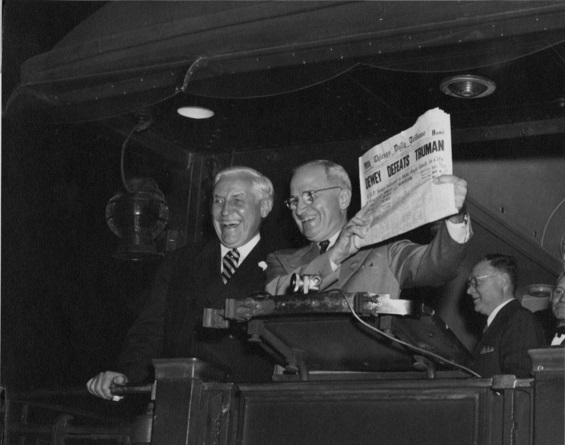 When Truman went to bed the night of the election, Dewey was the projected victor. Secret Service agents woke the president at 4:00 a.m. the next day, and told him to turn on the radio. Truman was ahead by two million votes. The Chicago Tribune posted its headline before the results were in. “Dewey Defeats Truman” it erroneously proclaimed. In 1960 the United States was deeply involved in the Cold War against the Soviet Union. Richard Nixon was well known as Dwight Eisenhower’s vice-president. 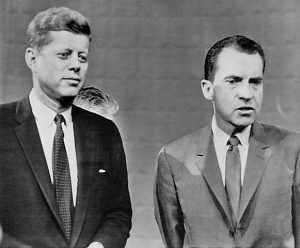 John Kennedy needed to introduce himself to the American public. He challenged Nixon to four televised debates. The results were close with less than 120,000 popular votes separating the candidates. There were charges of voting irregularities, but Americans accepted the outcome. In 1968 Richard Nixon ran again and was elected to two terms. 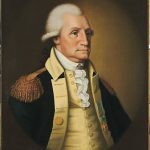 He became the only American president to resign his office. 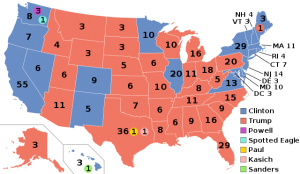 The 2000 Presidential Election was the first close election of the 21st Century. Officially, George W. Bush had 537,179 fewer popular votes than Al Gore, but he had five more Electoral Votes. The key battleground state turned out to be Florida where Bush held the lead by 1,1784 votes. The small margin triggered an automatic recount. The recount of machine votes reduced Bush’s lead to just over 900 votes. Al Gore requested a manual recount in four counties. The Florida Supreme Court ruled in favor of Gore’s request. Bush’s legal team argued that recounting votes in only four counties was a violation of the 14th Amendment, and also that punched ballots could be tabulated differently because Florida had no standards to hand count the votes. As the American public watched with increasing anxiety, Bush appealed to the United States Supreme Court. In the case of Bush v. Gore the Supreme Court ruled Florida’s recount process was inconsistent and violated the equal protection clause of the 14th Amendment. The Court further ruled there was no fair way to recount Florida votes before the state’s Electors were required to cast their votes. Therefore, the initial election results remained and Florida’s electoral votes went to George W. Bush. With one exception Americans have always respected the electoral process even if they haven’t agreed with the result. Our elections aren’t always close. We’ve had many landslide victories. But it’s the close elections that are the most troublesome, because they make us wonder who we really are. Congressional Elections take place November 6, 2018. 2016 Electoral College map by Gage. Creative Commons Attribution. 1860 Electoral College map. Public Domain. Franklin Delano Roosevelt by Leon A. Perskie. Creative Commons Attribution. “Truman Defeats Dewey.” Public Domain. 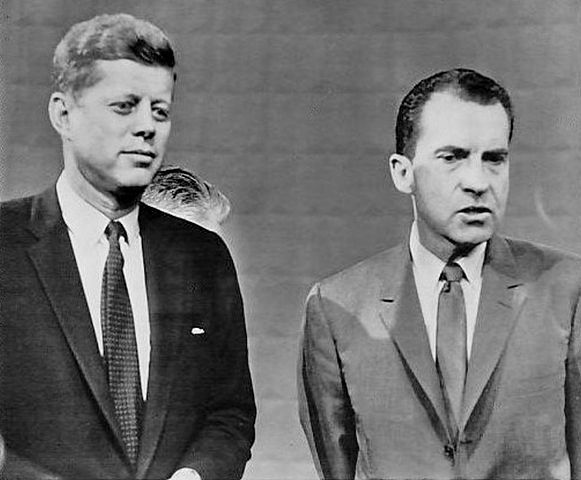 1960 Nixon-Kennedy Debate. Public Domain. 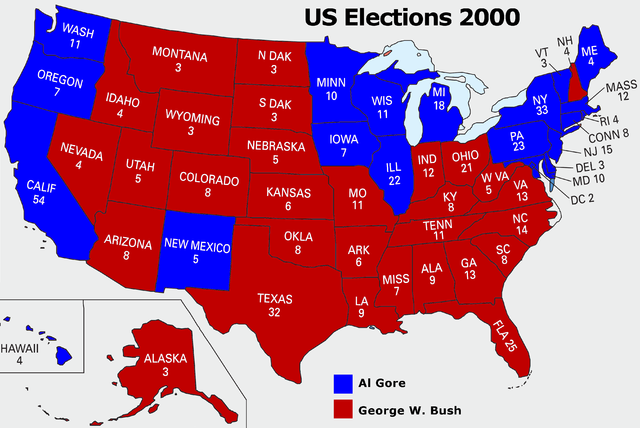 Bush-Gore 2000 Electoral College map. Public Domain. Capt. 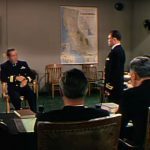 Queeg, Col. Jessup, & Rev. Hastie?